The new Supplemental Coverage Option (SCO), available through the federal crop insurance program, will be available for corn, cotton, grain sorghum, rice, soybeans, spring barley, spring wheat, and winter wheat in selected counties for the 2015 crop year. The first enrollment deadline is September 30, 2014 for winter wheat. Producers will have the option to purchase SCO through a crop insurance agent along with their underlying individual insurance policy. SCO is designed to cover county-wide losses and complement a producers’ individual insurance policy which is a new concept as producers have not previously been allowed to stack insurance policies for the same crop. To be eligible to purchase SCO, producers must also have an individual policy for the crop enrolled in SCO. The individual policy can be a Revenue Protection (RP) policy, a Revenue Protection with Harvest Price Exclusion (RP-HPE) policy, or a Yield Protection (YP) policy. SCO coverage is tied to the individual yield or revenue insurance policy. So a producer with an individual Yield Protection (YP) policy would only have the option to purchase an SCO yield protection policy (as opposed to a revenue protection policy). SCO will cover losses from 86% minus the coverage level of the producer’s individual policy. For example, if a producer has a 70% RP policy, the SCO coverage level would be 16% (86% – 70%). As shown in the figure below, SCO is only offered in certain counties/states for 2015 winter wheat and spring wheat crops. For Oklahoma, the list of counties with 2015 winter wheat coverage and the SCO expected county yields are shown in the table below. Enrollment in the new Price Loss Coverage (PLC) and Agriculture Risk Coverage (ARC) programs through the Farm Service Agency (FSA) are now tied to enrollment in the SCO crop insurance program. The USDA Risk Management Agency (RMA) just released rules/guidelines for the SCO program but the Farm Service Agency (FSA) has not released rules/guidelines for ARC and PLC. Therefore, the information provided in this blog post is based on my current (08/11/2014) understanding of the interaction between these programs and could change once all final program details are released. Producers who elect to participate in ARC are not eligible for SCO for the crop/farm number participating in ARC. Enrollment in ARC or PLC occurs on an FSA crop/farm number basis. Producers cannot receive benefits for both ARC and SCO on the same acreage/farm number of a crop. SCO is elected on crop/county basis so producers will need to report which acreage/farm numbers are enrolled in SCO and which acreage/farm numbers are enrolled in ARC. The ARC/PLC decision is a one-time decision that will remain in effect for the life of the farm bill. Producers will likely enroll in ARC/PLC in late 2014 or early 2015. The initial ARC/PLC enrollment is for the 2014 crop year (although it may not take place until 2015). SCO is not available for the 2014 crop year. SCO is available for certain crops/counties for the 2015-2018 crop years. The SCO election will take place each crop year when a producer enrolls in an individual RP, RP-HPE, or YP policy. A producer who enrolls a crop/farm number in ARC will not have the option to purchase SCO for that crop/farm number for any of the 2015-2018 crop years. The deadline to enroll in SCO for winter wheat for the 2015 crop year is September 30, 2014. For ARC and PLC, producers enroll base acres (with the exception of generic or cotton base acreage) but producers enroll planted acres in SCO. So, a producer could enroll base acreage of one crop in ARC on a particular farm number but plant a different crop on the same farm number and enroll that crop in SCO. Since producers will likely not be able to enroll in ARC or PLC prior to the Sept. 30 deadline for SCO coverage on 2015 winter wheat, SCO coverage can be withdrawn on any farm where producers intend to elect ARC for winter wheat by the earlier of their acreage reporting date or Dec. 15, without penalty. This allows producers additional time to make an informed decision between ARC or PLC for winter wheat. If producers withdraw SCO coverage for a farm by the earlier of their acreage reporting date or Dec. 15, they will not be charged a crop insurance premium. In order to withdraw coverage without penalty, producers must notify their crop insurance agent of their intended election for ARC by the earlier of their winter wheat acreage reporting date or Dec. 15. 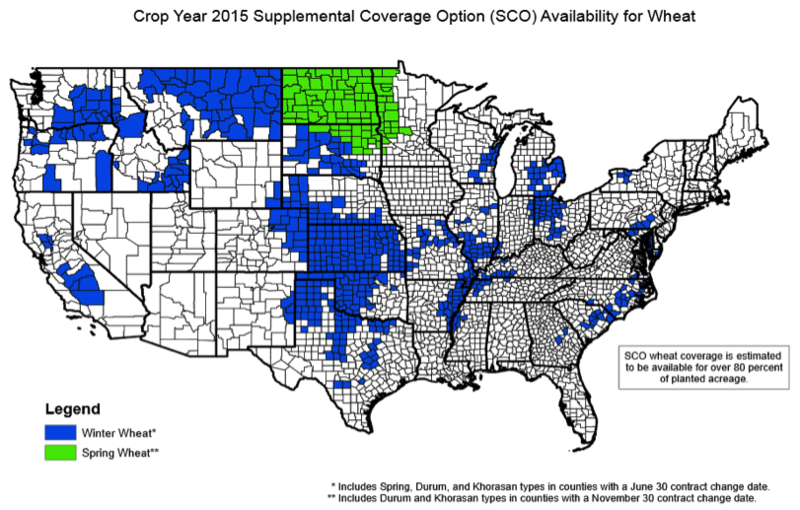 The option to withdraw SCO coverage will only be allowed for the 2015 crop year for fall planted wheat. A producer who chooses to purchase an SCO policy has several options. The producer could keep the previous coverage level on the individual RP, RP-HPE, or YP policy and add SCO coverage. As an example, if a producer has a 70% RP policy, the producer could buy 16% SCO coverage (86%-70%). The producer could also decide to lower the coverage level on the individual policy and add more SCO coverage. For example, the producer could lower RP coverage to 60% and buy 26% SCO coverage (86%-60%). However, it is important to note that if a producer decides to withdraw from SCO later this year (due to enrollment in ARC), the producer would not be able to change the coverage level of the underlying policy for the 2015 crop year. For example, assume a producer usually purchases a 70% RP policy on wheat. If the producer decides to lower RP coverage to 60% and purchase 26% SCO coverage (86%-60%) for the 2015 crop year, but then decides to withdraw from SCO, the producer would not be able to change the 60% RP coverage for the 2015 crop year. What level of coverage does the producer currently have on the individual policy? Is SCO offered for the crop/county in 2015 and/or later years? 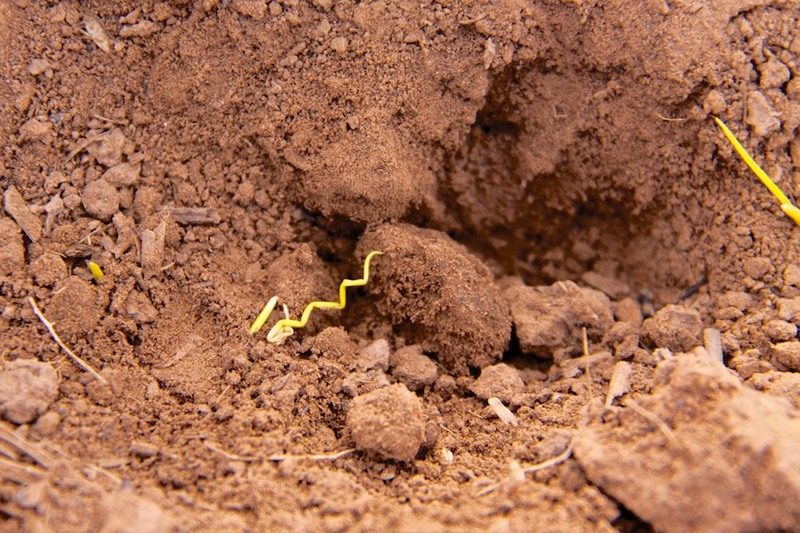 RMA may add additional crops/counties for the 2016 crop year. Does the producer currently have enterprise units on the underlying individual crop insurance policy? If so, the producer may want to examine the marginal costs of increased coverage on the underlying policy as opposed to adding SCO coverage. Enterprise units would cover losses closer to the individual farm-level than county-level SCO coverage (may cost less than SCO depending on coverage level). SCO covers losses at the county-level while an RP, RP-HPE, or YP policy covers losses at the farm level. If a farm-level loss occurs but a county-level loss does not occur, SCO would not pay an indemnity. If a farm-level loss does not occur but a county-level loss does occur, SCO would pay an indemnity. What is the cost of the underlying individual crop insurance policy? Can the producer obtain higher levels of coverage on the individual policy at affordable rates? If not, SCO could provide a higher level of coverage at a more affordable rate. The SCO premium subsidy is 65% compared to a 59% subsidy for a 70% RP policy (the subsidy varies for other levels of coverage on an individual policy). Does the producer want to enroll in ARC for a particular crop/farm number? If so, SCO is not an option for the same crop/farm number. Does the producer want to have the option to purchase SCO for a crop/farm number in a later year (after the 2015 crop year)? If so, the crop/farm number cannot be enrolled in ARC. Does the producer want to have more time to think about SCO for the 2015 winter wheat crop? If so, the producer may want to obtain SCO coverage for winter wheat prior to the Sept. 30 deadline and withdraw later if enrolling in ARC.